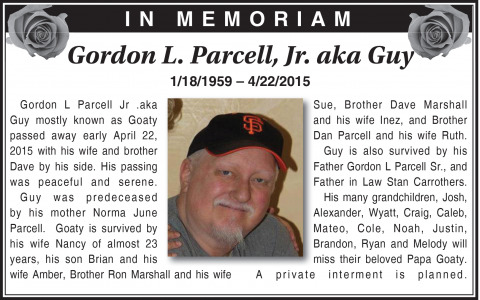 Gordon L Parcell Jr .aka Guy mostly known as Goaty passed away early April 22, 2015 with his wife and brother Dave by his side. His passing was peaceful and serene. Guy was predeceased by his mother Norma June Parcell. Goaty is survived by his wife Nancy of almost 23 years, his son Brian and his wife Amber, Brother Ron Marshall and his wife Sue, Brother Dave Marshall and his wife Inez, and Brother Dan Parcell and his wife Ruth. Guy is also survived by his Father Gordon L Parcell Sr., and Father in Law Stan Carrothers. His many grandchildren, Josh, Alexander, Wyatt, Craig, Caleb, Mateo, Cole, Noah, Justin, Brandon, Ryan and Melody will miss their beloved Papa Goaty. A private interment is planned.